HandsOn Miami inspires, equips and mobilizes people to take action to effect positive change in our Miami-Dade County community. HandsOn Miami volunteers celebrating success after dune restoration project with Youth Environmental Alliance. Youth Volunteers pose for a photo after an occurrence of our monthly "Open Mic Nite @ the Miami VA" service opportunity. HandsOn Miami is the Official Service Partner of Marlins Ayudan - the signature outreach initiative of the Miami Marlins. HandsOn Miami's Flexible Volunteer Opportunity Calendar, or 'Flex' Program serves as the primary door through which the majority of volunteers become involved with HandsOn Miami. The Flex Volunteer Program is designed to provide high-impact and meaningful volunteer projects that utilize a small group of volunteers to support recurring or ongoing projects that address a variety of community needs. Flex projects do not require special training or experience and can be accomplished within a 1.5-4 hour time frame during nontraditional hours to accommodate busy volunteers that would like the opportunity to give back to the community. All Flex opportunities take place on recurring basis - at least one time per month, all 12 months of the year - and do not require volunteers to possess any special or specific skills, attend an orientation, or complete a background check in order to participate. HandsOn Miami's Youth Program actively seeks to ensure that meaningful, high-impact opportunities are available for youth between the ages of 5 and 17. Our goal is to ensure that all youth gain a better understanding of our Miami-Dade County community by taking part in active and meaningful hands-on volunteer service that directly addresses the social and environmental challenges faced by Miamians. In an effort to ensure that HandsOn Miami's Youth Program is as contemporary as possible while working to inspire, equip, and mobilize youth volunteers to take action to effect positive change in a way that is meaningful to them, HandsOn Miami has established the Youth Advisory Council (YAC). HandsOn Miami's YAC is a youth Board of Directors that consists of 19, 13-17 year olds who represent 15 different schools. In addition to overseeing organizational operations relating to the Youth Program, the YAC is tasked with creating the youth-friendly volunteer opportunities. 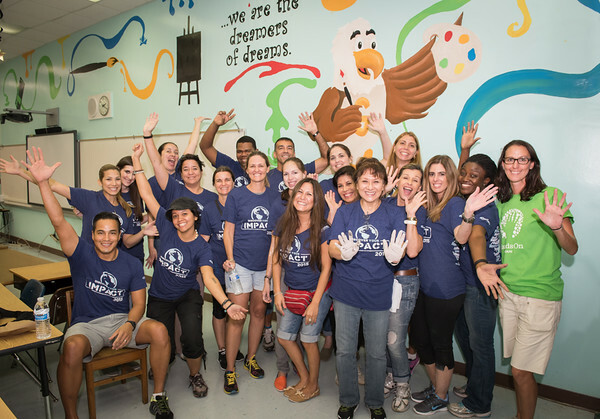 HandsOn Miami's Customized Day of Service (CDOS) offering empowers groups to take part in a custom-tailored volunteer service opportunity that best aligns with their strategic goals. Employed primarily by corporate teams, the CDOS allows groups to task HandsOn Miami with building a meaningful community service experience for them within specific guidelines that they set - date, time, general geographic location, impact area they would like to serve, and number of volunteers expected to participate. HandsOn Miami then coordinates a turn-key volunteer service experience that allows the team to complete a done-in-a-day experience that embraces the team's culture through a unique team-building process while also celebrating the group's community engagement, corporate social responsibility, and corporate citizenship efforts. The CDOS also ensures sustainability within HandsOn Miami programming. The CDOS program is a fee-for-service offering that generates revenue. ServiceWorks is a groundbreaking, national program that uses volunteer service as a strategy to help 25,000 underserved youth and young adults develop the skills they need to prepare for greater college and career success. In collaboration with the corporate and community volunteers and the young adults we bring together, ServiceWorks is transforming communities across the nation. HandsOn Miami is proud to activate ServiceWorks within our Miami-Dade County community and impact the lives of 180 youth and young adults during the 2016-2017 program year.